Chicken, Chicken Meal, Pearled Barley, Oatmeal, Sweet Potatoes,Brown Rice, White Rice, Dried Whole Egg, Menhaden Fish Meal, Millet,Chicken Fat, Dried Tomato Pomace,Safflower Oil, Herring Meal, Cheese,Flaxseed, Carrots, Broccoli,Cauliflower, Apples, Green Beans,Chicken Cartilage, Potassium Chloride, Cranberries, Blueberries,Salt, Monocalcium Phosphate,Chicory Root Extract, Alfalfa Sprouts,Calcium Sulfate, Yucca Schidigera Extract, Sodium Selenite, Folic Acid,Taurine, Parsley, Sorbic Acid (Preservative), Vitamins, Minerals,Probiotics. 5 lb, 15 lb, 30 lb. 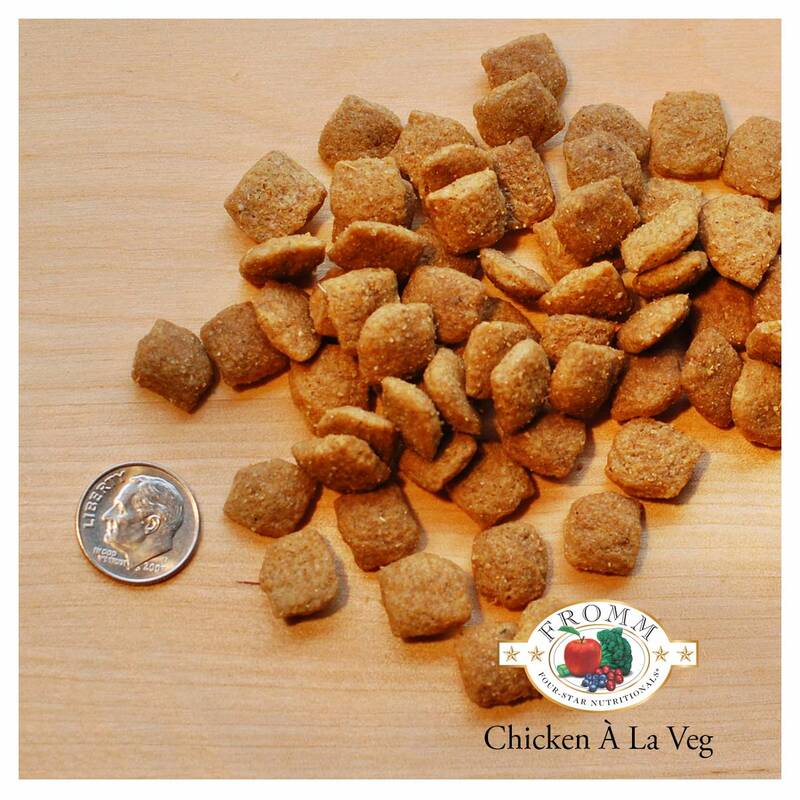 Fromm Four-Star Nutritionals® Chicken À La Veg® Food for Dogs is formulated to meet the nutritional levels established by the AAFCO Dog Food Nutrient Profiles for All Life Stages, including growth of large size dogs (70 lb. or more as an adult).